We have decided to begin this months meeting at 6pm, along with all future meetings. Our updated meeting schedule will go as follows: 3rd Monday of the Month 6pm-8pm. We hope that you will benefit from our extended group time! Our area has had a very strong nectar flow, we advise that you check hives to ensure adequate room to expand. 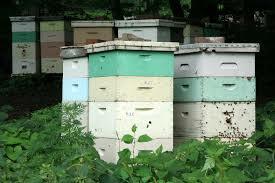 Honey and nectar bound hives are very restricting, if not eliminating areas for queens to lay. Swarming in these conditions can become very likely, take proactive preventive measures now! This month will give our members the opportunity to join us in the bee yard to perform routine tasks and inspections. Hands on learning will help to expand your knowledge and confidence beyond the group meetings . Please begin gathering at the Olive Library at 6pm, departure will be 6:15pm sharp. Rob and I will both be providing transportation, we may need one or two more volunteers to offer help with car-pooling. We also ask that you bring a veil to wear and any other protective gear to meet your comfort needs. Since the honey flow is on, here is a very interesting video showing large scale honey extraction.